In Praise of Good Business celebrates the great business turnaround of the 1990s. But it does more than that. It shows the management skills needed to continue the management revolution. 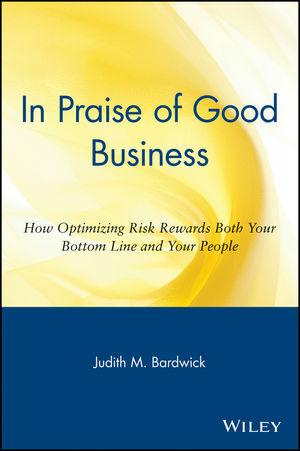 In her 1991 international bestseller, Danger in the Comfort Zone, Judith Bardwick showed the basis for the hard management decisions that provided the framework for the American economic resurgence. She now cautions us not to rest on our success and lays out very specifically how we need to manage in the new economic environment. Drawing on her work both as a psychologist specializing in management psychology and her 25 years as a consultant to the Fortune 500, Dr. Bardwick explains how and why the benefits of today's best business practices-those forged in the crucible of a global marketplace-extend well beyond a healthy balance sheet. Human beings thrive on manageable risk, and, by compelling employees to take more risks, accept more responsibility and succeed, business is not only achieving record profits, but it is also helping to create psychologically healthier people and a more resilient society. To more vividly illustrate her points, Dr. Bardwick presents fascinating and instructive case studies of uniquely successful companies across North America. From these she extracts valuable object lessons and action steps, and she develops a revolutionary new management model based on the principle of productive insecurity. A style of management pitched to the demands of a "borderless economy," her prescriptive approach entails steering a middle path between the macho, show-no-mercy downsizing approach and the "no-consequences" model of too much security and too little accountability. Both, she contends, are a leading cause of company failures. In Praise of Good Business presents a very positive message. Offering an elegant, highly doable prescription for creating more courageous, self-reliant employees ready to meet the challenges of today's supercompetitive global economy, In Praise of Good Business is an invaluable working resource for executives and managers in organizations of all sizes. Far-reaching and grounded in the very nature of the human psyche, this is the only management book you'll ever need. In her more than two decades as a consultant and speaker, Dr. Bardwick has researched and contributed much to broaden business's understand-ing of the key contributing factors to human and organizational effectiveness. Her client list includes dozens of Fortune 500 companies, including Hewlett Packard, Champion Paper, IBM, Andersen Consulting, and National Steel. JUDITH M. BARDWICK, PhD, is President of the management consulting firm Bardwick & Associates and Clinical Professor of Psychiatry at the University of California, San Diego. She is the author of the international bestseller, Danger in the Comfort Zone, which has been described as "a wake-up call to end a culture of entitlement." Driven by Results: Operating in Earning. Changing an Organization's Culture is Hard. Operate in Optimum Ways: Collaboration. Operate in Optimum Ways: Selection. Operate in Optimum Ways: Method. What Matters Most in Managing Today. Presumption of Rights, Fear, and the Loss of Ethics.